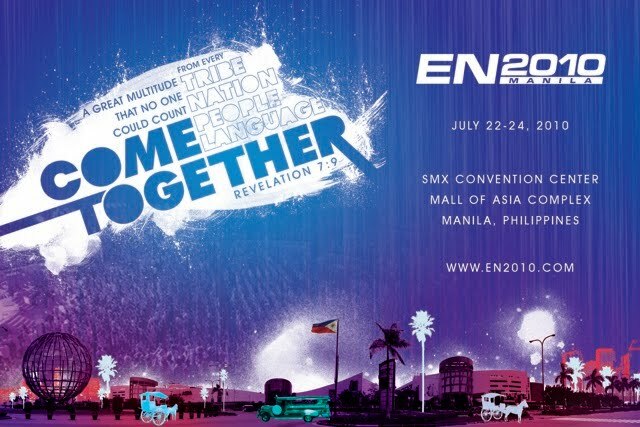 Every Nation churches across the globe will be gathered once again in a world conference called EN2010 to be held at SMX Convention Center in Pasay City, Metro Manila on July 22-24, 2010. This event is being held every 3 years and it's something that I look forward to attending. And this year, Manila, Philippines is hosting the event for the second time; the first time was in July 2007 held at Araneta Coliseum (main conference venue) and Gateway Cinema (kids church). Ron Lewis, Rice Broocks, Steve Murrell and more! I finally got my EN2010 ID packet thru LBC courier service last July 15, 2010. The first day of EN2010 will begin at 7:00PM and end at 9:00PM. Gates open at 5:00PM. The night kicks-off with a powerful opening number by our Every Nation family from around the world followed by our traditional Parade of Nations. Bring your best national costume and represent your nation at EN2010! Surprises await you on the second day of EN2010 which will start at 2:00PM and end at 9:30PM! Gates open at 12:00NN. Enjoy a 3-hour break in between and stroll around one of the biggest malls in the world – the SM Mall of Asia – which is a short walking distance from SMX. Get ready when you get back because, all together, we will cap the night with an attempt to make a Guinness World Record. Be there or be square! Wake up early and enjoy Manila’s sunrise by the bay! The third day of EN2010 will begin at 10:00AM and end at 5:00PM with a 3-hour break in between. Gates open at 8AM. Get ready to shake the place as we do the Haka with Haka dancers from New Zealand and end the day with communion.